If you’re in the process of starting a business or writing a business plan document, you’ll have heard the phrase “balance sheet” mentioned, or maybe you’ve seen one in a sample business plan. The balance sheet is one of three essential parts that form the bedrock of a company’s financial statements: cash flow, balance sheet, and income statement. The idea behind a balance sheet is fairly straightforward: it shows your company’s assets, liabilities, and owner’s equity at a specific point in time. Put simply, a balance sheet shows what a company owns (assets), what it owes (liabilities), and how much owners and shareholders have invested (equity). A balance sheet always has to balance—hence the name. Assets are on one side of the equation, and liabilities plus owner’s equity is on the other side. If you think about it a little more, this is actually common sense. Companies have to pay for everything that they own (assets) by either borrowing money (liabilities) or by getting money from owners and investors (equity). In addition to showing you what a company owns and what it owes, balance sheets can also tell you a company’s net worth. Now that we’ve had a general overview of the balance sheet, let’s take a deeper look at the information a balance sheet should include. 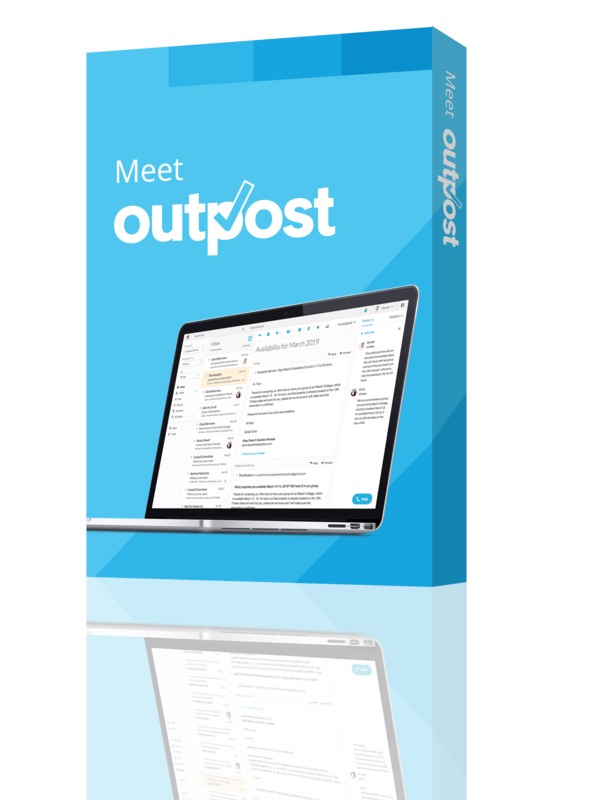 If you’re just getting started, download our free Balance Sheet Template. 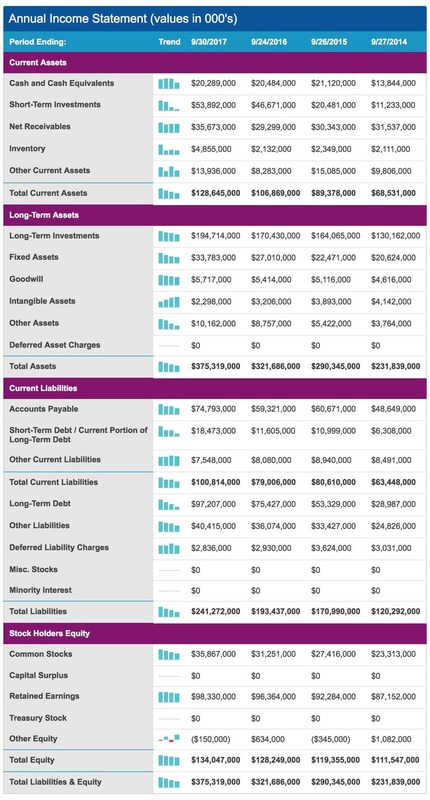 A balance sheet in LivePlan. As businesses differ from one another, so will their assets and liabilities. The inclusion of certain line items and their titles will vary slightly from business to business, but the equation remains the same: your business’s assets must equal its liabilities plus equity. Assets on a balance sheet or typically organized from top to bottom based on how easily the asset can be converted into cash. This is called “liquidity.” The most “liquid” assets are at the top of the list and the least liquid are at the bottom of the list. A cash equivalent is an asset that is liquid and can be converted to cash immediately, like a money market account or a treasury bill. Accounts receivable is money people are supposed to pay you, but that you have not actually received yet (hence the “receivables”). Usually, this money is sales on credit, often from business to business (or “B2B”) sales, where your business has invoiced a customer but not received payment yet. Inventory includes the value of all of the finished goods and ready materials that your business has on hand but hasn’t sold yet. Long-term assets are also referred to as “fixed assets” and include things that will have a long-standing value, such as land or equipment. Long-term assets typically cannot be converted to cash quickly. Accumulated depreciation reduces the value of assets over time. For example, if a business purchases a car, the car will lose value as time goes on. This term total long-term assets is sometimes used to describe long-term assets plus depreciation on a balance sheet. Like assets, liabilities are ordered by how quickly a business needs to pay them off. Current liabilities are typically due within one year. Long-term liabilities are due at any point after one year. Accounts payable is the money that your business owes, the other side of the coin to “accounts receivable.” Your accounts payable number is comprised of the regular bills that your business is expected to pay. Pay attention to whether this number is exceedingly high, especially if your business doesn’t have enough to cover it. This only applies to businesses that don’t pay sales tax right away, for example, a business that pays its sales tax each quarter. That might not be your business, so if it doesn’t apply, skip it. This is debt that you have to pay back within a year, usually any short-term loans. This can also be referred to on a balance sheet as a line item called current liabilities or short-term loans. Your related interest expenses don’t go here or anywhere on the balance sheet; those should be included in the income statement. The above numbers added together are considered the current liabilities of a business, meaning that the business is responsible for paying them within one year. These are the financial obligations that it takes more than a year to pay back. This is often a hefty number, and it doesn’t include interest. For example, this number reflects long-term loans on things like buildings or expensive pieces of equipment. It should be decreasing over time as the business makes payments and lowers the principal amount of the loan. Everything listed above that you have to pay out or back compiled together. Money paid into the company as investments. This is not to be confused with par value of stock, or market value of stock. This is actual money paid into the company as equity investments by owners. This doesn’t apply to all legal structures for a business; if you are a pass-through tax entity, then all profits or losses will be passed on to owners, and your balance sheet should reflect that. This is an important number—the higher it is, the more profitable your company is. This line item can also be called income or net profit. Earnings are the proverbial “bottom line”: sales less costs of sales and expenses. This is that final equation I mentioned at the beginning of this post, assets = liabilities + equity. Including a balance sheet in your business plan is an essential part of your financials. There are three aspects of business financials that are really indispensable; the income statement, cash flow statement, and the balance sheet. These statements give anyone looking over the numbers a solid idea of the overall state of the business financially. In the case of the balance sheet in particular, what it’s telling you is whether or not you’re in debt, and how much your assets are worth. 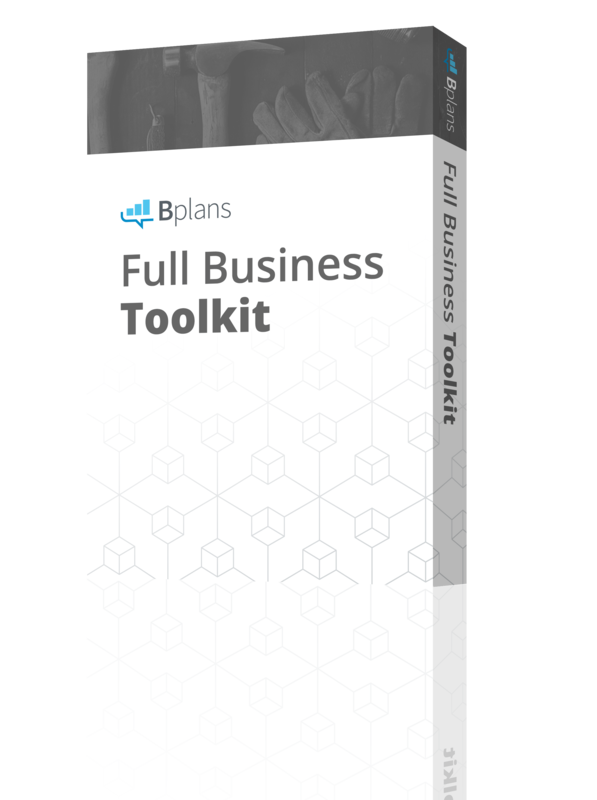 This information is critical to managing your business and the creation of a business plan. Large businesses will have longer and more complex balance sheets for their businesses, sometimes having separate balance sheets for different segments or departments of their business. A small business balance sheet will be more straightforward and have fewer line items. Here is a balance sheet from Apple, for example. You’ll see that it includes a complex stockholder’s equity section and several specifically itemized types of long-term assets and liabilities. You’ll also notice that it says “Period Ending” at the top; this indicates that these numbers are reflective of the time up until the date listed at the top of the column. This terminology is used when you are reporting actual values, not creating a financial forecast for the future. Here is a balance sheet (also included above) from a LivePlan sample business plan. 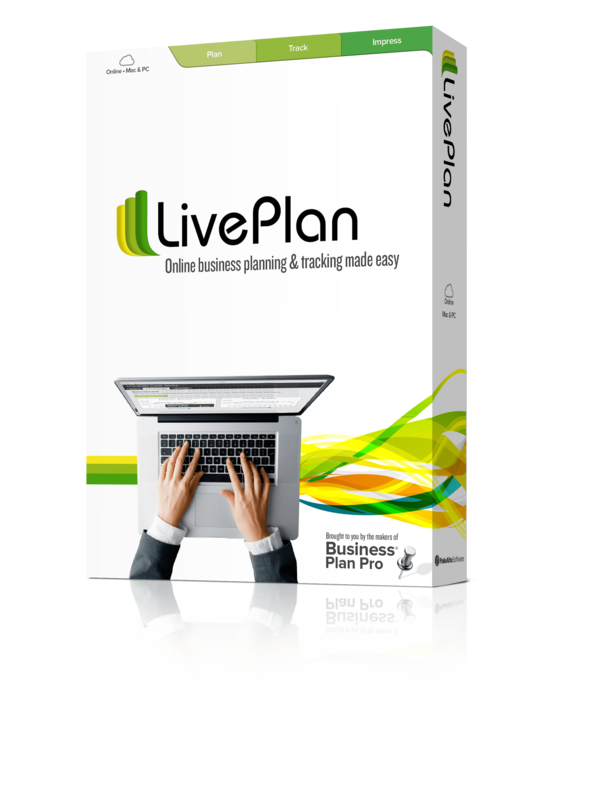 LivePlan is a cloud-based business plan writing software with a business dashboard. 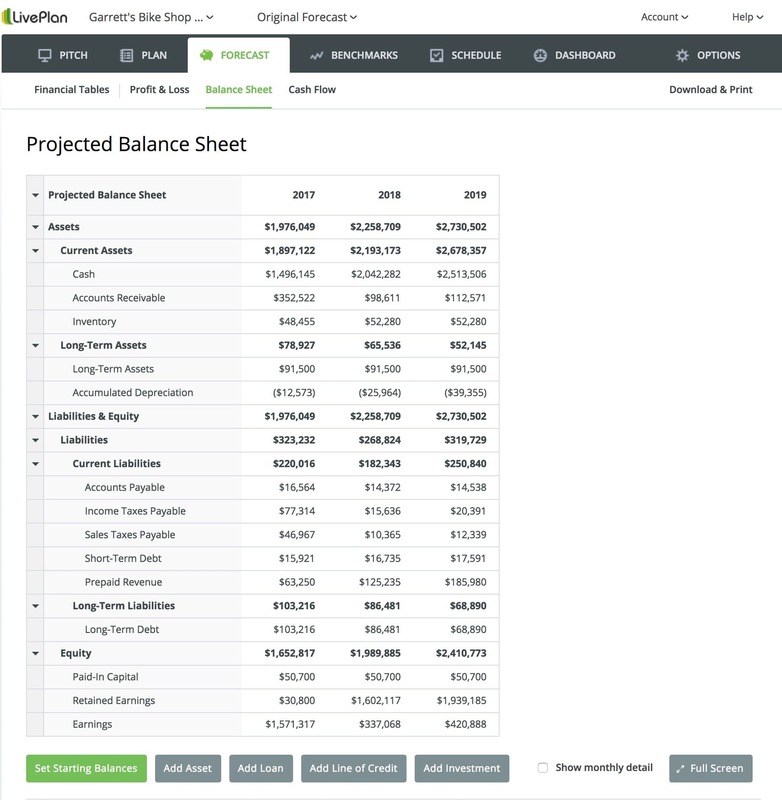 You can see that is called a “projected” balance sheet, which indicates that these numbers are estimates of the future being used for business planning purposes, not a record of actual values. There are also fewer line items and it is simpler overall. Do you have more questions about balance sheets? 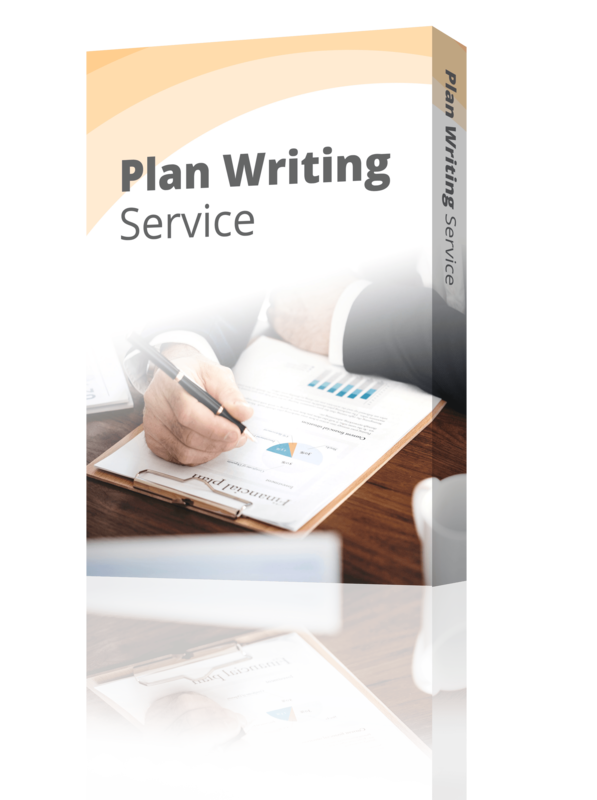 Let us know on Twitter @Bplans!